CRP offers an acupressure program to help our beneficiaries cope with stress. 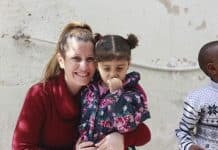 Many of the refugees who come to CRP’s activities have been affected by trauma, and all have been affected by loss and by separation from loved ones. 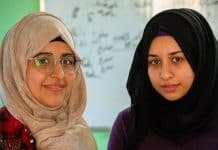 With uncertain futures and unstable presents, they also cope with incredible amounts of stress over how they will continue to support their families, pay the rent, afford groceries, pursue educations, and make plans for their lives. It’s no wonder that many of the people at our center struggle with headaches, anxiety, nightmares, and insomnia. We have found acupressure to be an effective way to reduce stress among the women in our community. Our small women’s acupressure program meets twice a week, with women in our community providing acupressure to each other. 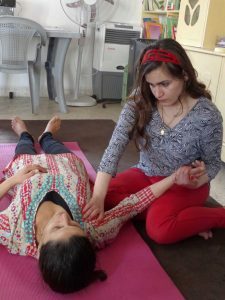 CRP’s acupressure program began near the end of 2015, when a small group of women participated in a week-long training on acupressure and acupuncture. Acupressure is an alternative medicine technique that has been used in China for thousands of years. According to traditional Chinese medical theory, the body contains acupressure points that lie along meridians in your body. These meridians are channels through which energy, or the life force qi, flows. Blockages or imbalances in these channels can cause illness and pain. According to this theory, acupressure and acupuncture help restore the balance. During an acupressure session, practitioners apply pressure to various points in the body. Though the science behind acupressure and acupuncture is debated in the Western world, many people have found it to be effective in reducing stress and anxiety and in healing from chronic pain. Acupressure is an ancient Chinese technique. Acupressure is just one of many programs aimed stress relief. 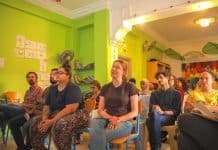 Others include Keystone, our men’s exercise and discussion program; Diwwaniya, our men’s support group; Yoga, which is offered to women, men, and children; and art therapy. To support our acupressure and other stress-reducing programming, donate here. Your dollars help us keep our center running! Previous articleThis Summer: Hot, Busy, & Fun! Next articleGoodbye & Good Luck, Abu Ahmed!